"A brave and absorbing film... Unique. I want to see it again"
"Artful and poetic...a nourishing and exceptional film." 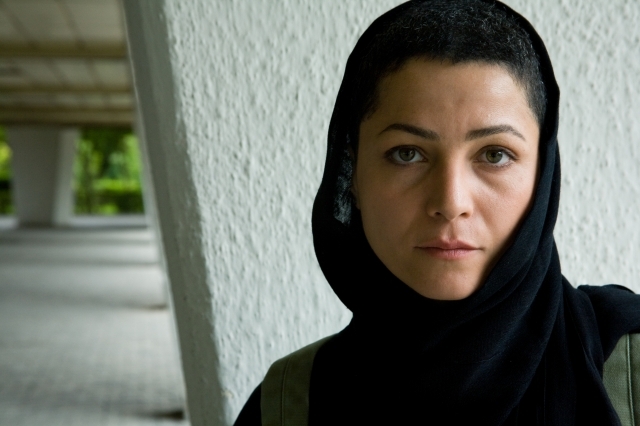 "It works cinematically on every level"
Marzieh is a young female actress living in Tehran. The authorities ban her theatre work and, like all young people in Iran, she is forced to lead a secret life in order to express herself artistically. At an underground rave, she meets Iranian born Saman, now an Australian citizen, who offers her a way out of her country and the possibility of living without fear. Shot entirely on location in Tehran, MY TEHRAN FOR SALE tells the story of modern day Iranian youth struggling for cultural freedom. It brings to the screen never before seen images of modern urban Iran, and reveals how young Iranian people live behind closed doors. MY TEHRAN FOR SALE is the first Iranian/Australian feature film collaboration and is the directorial debut of contemporary poet Granaz Moussavi. The story of MY TEHRAN FOR SALE has been with me for the past decade. I always wanted to tell the story of my generation: the story of a life of double standards, contrasting lessons at home and in school, a life of lies and pretence, fear, and seeking shelter as soon as you step out of your home to enter the world. MY TEHRAN FOR SALE is the story of my youth in Tehran. Living, loving, and working underground and behind closed doors, and how we tailored our behaviour in the outside world. When I was young and at school, colourful clothes and jeans were banned, white socks and sneakers were banned, even laughing aloud was a matter of criticism because it was a time of war and revolution. We had to be serious and loyal, obedient and not questioning. We had to pretend to be old and sad while we were only young and like any other teens in the world. The fear and how we learned to pretend all the time and were told how to behave according to the unwritten standards, stayed with many of us. What remains are huge question marks and scars, and stories to be told, one day sooner or later. The film's story is shaped around my personal life experience growing up in Tehran, and observing people around me, at school, in Uni, and later on at work. Marzieh Vafamehr herself was one of the central inspirations. I witnessed Marzieh's struggle to build a life of her own and to survive as an actress in Iran under circumstances that threaten her morals, principals, and viewpoints as an artist and as a woman. When I travelled to Iran and visited Marzieh it motivated me to make a film with her to tell OUR story - the story of young modern Iranian women who fight against all the odds under the political and social situation to preserve their principals. We had long hours of talking and rainstorming about the best way to tell our story that demonstrated what we went through growing up in an upside down, rapidly changing society during and after the war in 1979, and during and after the reforms. It was important for us to also show that we feel we are going backwards, and yet hope for better days to come. We have seen the media fabricated side of Iranian people on all screen sizes worldwide, and I wanted to tell my side of the story. By no means do I pretend that the characters of MY TEHRAN FOR SALE represent ‘young Iranian people’ in general, although it is true that they are definitely mirroring many real people of urban contemporary Iran who do exist and have their own stories to tell. However, I am aware that these stories might not be of the kind that the media has so far created or wanted the audiences to see, they are far from "exotic" or "oppressed" stories. I grew up always wondering why the world was so interested in seeing only these aspects of Iran? Is it intentional or merely a matter of coincidence? I wonder! To portray Tehran today, I needed special cinematography and colours, back and forth slices of a fluid storyline that would shape the jigsaw in the end. And the end itself of course had to be open, loose, and not perfectly resolved. This style formed from my understanding and influences of what Abbas Kiarostami has offered as his half-made cinema to be completed in the minds of the audiences. To this, I have added my own findings of patchwork narratives and fluidity of storytelling, ever blending forms of cinematic, theatrical, and even poetic devices blurring the borders between them, as well as the fine line between real and unreal, abstract images and documentary-like scenes bleeding into one another. The result could be a jigsaw that has no intention of being comfortably digested but is honest and lively, and is experienced with all the complexities that surround our lives in urban Iran today. Bonnie Elliott was my choice for Director of Photography from day one, because of her distinguished hand held technique, her special use of lighting and colours, and framing. Her style helped to portray the chaotic and changing urban life of our characters. It was important that all the music in the film was authentic and contemporary. Mohsen Namjou’s music wraps up the film in the end, and interprets the rhythm of my generation into music and lyrics. And the main actors? It was only natural for me to go back to my roots and work with people who felt the same sort of urge to tell such a story. Marzieh, Asha (Sadaf) and I were friends in real life. I was a classmate with Asha in High School, and a classmate with Marzieh in drama college since we were teens. I also had grown up with Amir (Saman) since birth. We all came from different life stories and upbringings but shared almost the same memories of fears and scars and the hard earned moments of happiness during the harsh times of the contemporary history of our country. This story is told from my personal perspective, having first hand experience immigrating to Australia with my whole family and going through the process of applying for visas. The lives of everyone in my family were on hold for five years while we waited for the visas to be approved and we went through three rejections before the final approval. Very soon after I came to Australia I started working as an interpreter and a social worker so my focus was on the refugee and migrant community in Australia. I also volunteered in Woomera detention centre working with asylum seekers. That was how I got very close contact with asylum seekers and I listened to a lot of stories and tried to link all these stories together, weaving them in my mind into this film now. Unlike some other migrant nations, the migrant Iranians have not completely settled. They continue living out of their suitcase, waiting for the slightest signs of a social or political change that would enable them to return to their homeland. For this reason, I consider that they live mostly in exile whether they are refugees or have legally immigrated. I wanted to tell a simple story of a bunch of middle class friends in modern contemporary Tehran. The story of everyday resistance in simple and even ordinary ways to seek a little share of happiness and freedom in life. Granaz Moussavi was born in tehran. she received a degree in screen studies from Flinders University in adelaide and a postgraduate degree in film editing at the australian Film television and radio school, and is a doctoral candidate in film studies and filmmaking at the University of Western sydney. She is the author of four collections of poetry and has directed and edited several short films and documentaries. mY teHran For sale is her first feature film.